Osaka – Chronic obstructive pulmonary disease (COPD) is an inflammatory disease that causes obstructed airflow from the lungs, and it is expected to be the third leading cause of death globally by 2030. At present, only symptomatic therapies for COPD are available. COPD is considered a modern-day lifestyle disease, mainly because of its association with smoking and the inhalation of secondhand cigarette smoke. COPD and aging are known to share common mechanisms. Hence, COPD is considered to be a model for accelerated senescence (deterioration of cell functions with age) of the lungs, similar to other lifestyle-related diseases. Among the key players in mammalian aging are a class of proteins known as sirtuins (SIRT). In particular, SIRT1 plays an important role in governing management of cellular stress management and ensuring a healthy lifespan. SIRT1 expression is reportedly reduced in chronic inflammatory conditions, including aging and in the lungs of COPD patients. Meanwhile, tetraspanins have emerged as key players in malignancy and inflammatory diseases. Tetraspanins are cell-surface proteins that span the membrane four times and are ubiquitously expressed in multiple organs. A unique feature of tetraspanins is their tendency to interact with one another and with other molecules. CD9 and CD81, two closely related tetraspanins, are expressed abundantly in the lung. Notably, both CD9 knockout (KO) and CD81 KO mice exhibit quite similar phenotypes, such as infertility. A team of Osaka University-centered researchers has now achieved preliminary results on CD9/CD81 double-knockout (DKO) mice being more susceptible to cigarette-smoke-induced emphysema, a progressive lung disease caused by over-inflation of the air sacs in the lung. Considering that CD9/CD81 DKO mice develop not only emphysema but also some of the extra-pulmonary diseases seen in COPD patients, such as body weight loss and osteoporosis, the researchers regard these DKO mice as a novel model for human COPD. "As COPD is increasingly viewed as accelerated senescence of the lungs, and that these tetraspanins have pleiotropic functions as molecular facilitators in a wide range of cells and tissues, we also wanted to explore the aging-like phenotype and its underlying mechanisms in this mouse model of COPD," explains Yingji Jin, first author of the team's recent study, which was published in Scientific Reports. The researchers found that CD9/CD81 DKO mice with the COPD-like phenotype progressively develop an accelerated aging syndrome, with symptoms including cataracts, osteoporosis, emphysema, and atrophy of the skin, muscle, and adipose tissue. In mechanistic terms, the findings revealed that double deletion of CD9/CD81 in epithelial cells that line the insides of the lungs downregulates the expression of SIRT1, thereby decreasing cell proliferation and augmenting inflammation. 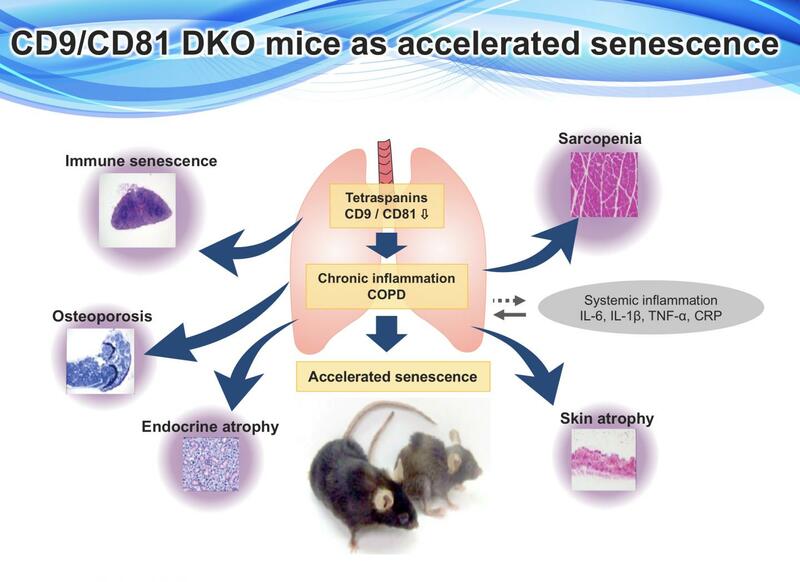 Thus, CD9/CD81 DKO mice could represent a unique model for COPD leading to accelerated senescence. "Furthermore, using a drug-repositioning strategy, we identified 72 drugs that upregulate CD9 expression from a library of 1,165 compounds. Among them, the statins exerted anti-inflammatory effects by upregulating tetraspanin CD9 and CD81 expression in macrophages," adds corresponding author Yoshito Takeda. "Given that SIRT1 is considered a key molecule that protects against various lifestyle-related diseases and aging, the molecular organizers CD9 and CD81, which may maintain the expression of SIRT1 and other aging-related pathways, could serve as novel therapeutic targets, not only for COPD but also for aging more generally."